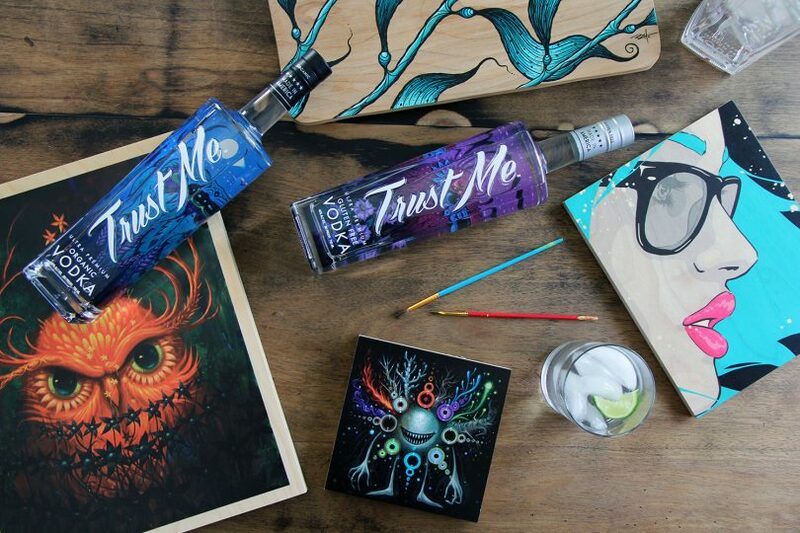 Trust Me Vodka supports visual artists by allowing a total takeover of our bottles, offering them a wide-ranging commercial canvas. It’s our thought that vodka may be colorless, but the bottles don’t have to be. Our first collaboration with our friend, Jeff Soto, launched with our brand in 2016. Jeff is a contemporary artist from Riverside, California. 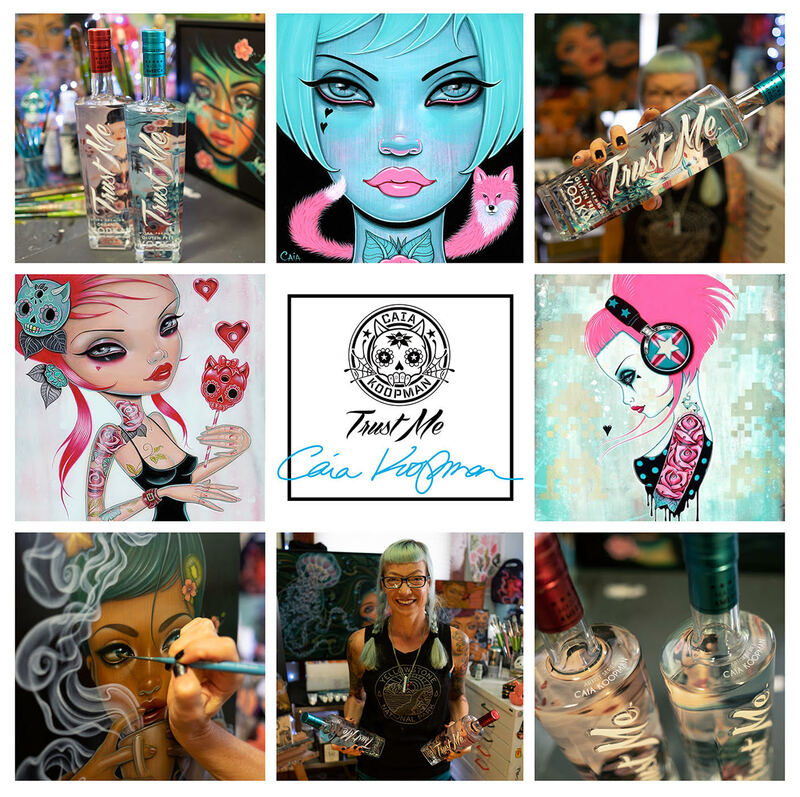 We then joined forces with James Haunt, a young and vibrant street artist from L.A. and have since partnered with Tara McPherson, an American artist from New York City; Emek, the official Coachella artist with art that has been seen across the globe; and Caia Koopman a modern day pop artist. Johnny ‘KMNDZ’ Rodriguez. A successful leader in the graphic design community, this Los Angeles based artist, has worked for some of the world’s premier design agencies and top entertainment companies. 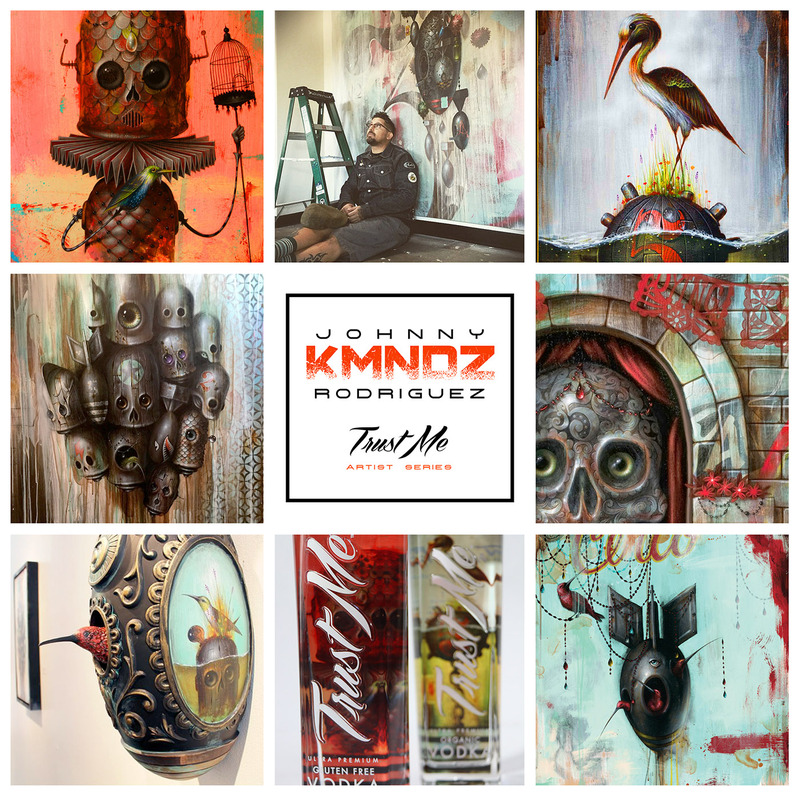 With brands like MTV Networks, Universal Pictures, Microsoft, Lexus, Disney, and Activision populating his resume, Johnny has built an impressive portfolio of both artistic and technological accomplishments in the world of graphic design and new-media. Caia Koopman is a preeminent pop surrealism artist who has been featured in prominent galleries from California to Canada and France. Over the years, her paintings have graced the walls of Thinkspace, Spacejunk, and La Luz De Jesus Galleries as well as the pages of numerous books and magazines. The appealing symbols in her work evoke fundamental human emotions in exquisite, surreal detail making them well received in the action sports industry as well as the fine art world. Signature series Oakley sunglasses and goggles are adorned with her designs while her illustrations swirl across designer Rossignol snowboards, skis and more. While attaining her BA in Fine Arts from the University of California in Santa Cruz, Caia was a skateboard enthusiast immersed in the punk rock scene of the ‘80s. She continues to live in Santa Cruz where the youthful vitality of a college town is an ever-present, pulsating force. Her professional career began by creating designs for skateboards and snowboards. Enchantingly beautiful female characters in her paintings are imbued with this fearless sense of defiance. As a second-generation conservationist, loving the environment and acutely aware that humanity is dangling our planet over a dangerous flame of pollution, nature is often woven into the haunting fabric of her images. Birds, flowers, plants, butterflies, animals and mythical creatures are interlaced with iconic symbols of love, mystery, soul searching and timeless values. Lurking throughout these visual fantasies are “Día de los Muertos” skulls, cute yet macabre reminders of the interlocking yin and yang of life and death. Koopman’s popularity stems from the dazzling, intricate dreamscapes that depict deeply-rooted subconscious themes flavored with contemporary culture. Feminine energy infused with power and daring is blended with delicate elegance. An edgy juxtaposition of seemingly contrary ideas and emotions is persistent, and reflects the uneasy balance we maintain with our 21st century lifestyles. Technology coexisting with nature. Vulnerability accompanied by strength. Streetwise sensibility embodied in dainty, tattooed nymphs. Whimsy in spite of pathos. Vibrant life hand in hand with death. These fundamental aspects of the human condition, surrounded by the elements of modern life, all flowing through gorgeous imagery, are the essence of Koopman’s masterpieces. 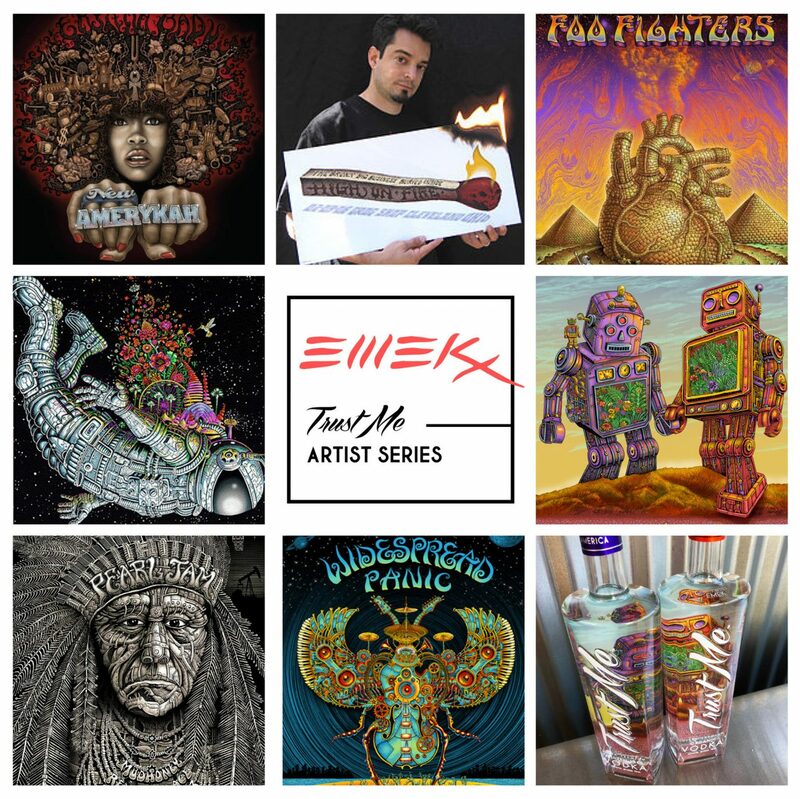 EMEK x is a designer, illustrator and fine art painter. Famously penned “The Thinking Man’s Poster Artist” by punk- rock singer Henry Rollins while working on his album cover for A Rollins in the Wry. Emek’s style, known for its attention to detail and layers of meaning, infuses socio-political commentary into pop culture imagery. All of Emek’s artwork is originally hand-drawn and then hand-silkscreened for each actual concert or event, usually in limited editions of around 300. Emeks’ art has appeared in films, galleries, and walls of fans and venues worldwide. Over the last decade, Emek’s work has been shown in galleries across the United States, in Berlin, London and Tokyo. He has painted album covers and posters for Neil Young, Pearl Jam, Radiohead, Queens of the Stone Age, SoundGarden, Black Crowes, Beck as well as for many popular musicians and alternative bands, notably for singer/ songwriter Erykah Badu. You might even recognize his trademark style featured on numerous Coachella posters over the years. Trust Me Vodka has now released it’s Organic and Gluten free collector bottles, featuring Emek’s peaceful robots holding hands and bringing the two together to make one beautiful piece of art. 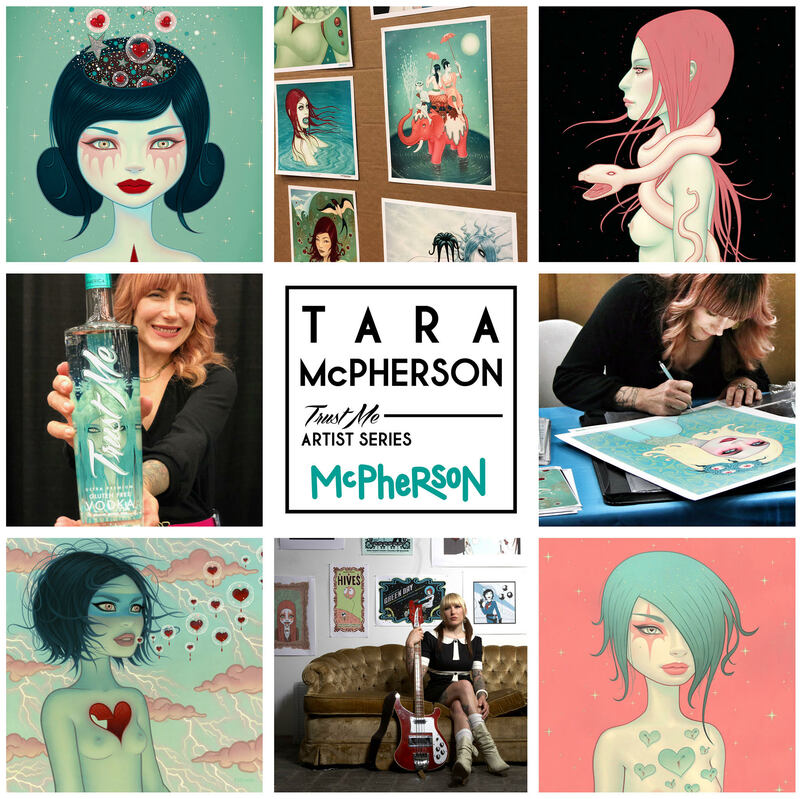 Tara McPherson is an American artist based out of New York City. Named the crown princess of poster art by ELLE Magazine, she has created numerous gig posters for rock bands such as Beck, Modest Mouse, and Mastodon. Her paintings consist of primarily females inspired by mythology, science and nature.Tara’s art is featured in gallery exhibitions and museums and can be easily found at her Cotton Candy Machine, located in NY. Specializing in limited edition art prints, posters, apparel, books, toys and more by Tara and select contemporary artists. James Haunt was raised in Los Angeles, where he became interested in art through comic books, graphic novels and pop culture. As Haunt evolved as an artist, he got into the graffiti scene, using spray cans as his media and cityscapes as his canvas. Haunt grew as an artist and brands within the action sports industry took notice, offering him a legitimate forum for his art. He’s created murals for Red Bull, Big Bear Resort, Porsche, Hotel Erwin, Chris Brown, Electric Eyewear and at numerous locations in the Los Angeles and Palm Springs areas. For his collaboration with Trust Me Vodka, Haunt chose a bright, summery theme to coincide with the summer launch. Jeff Soto is an American contemporary artist. His distinct color palette, subject matter and technique bridge the gap between Pop Surrealism and Street Art. Jeff’s bold, organic style is a natural complement to the Trust Me brand. Trust Me Vodka is proud to present Jeff Soto’s art “Crescent Moon” and “Full Moon” on our Gluten Free and Organic Vodkas.